Duberria lutrix, or the common slug eater, is a small, ovoviviparous, molluscivorous, nonvenomous snake, which is endemic to Africa. Total length of adults is thirty to forty cm (approximately twelve to sixteen inches). The common slug eaters' colours vary, but typically have an olive green to brown or russet back, grey flanks, a yellowish or cream belly, and a black, more or less complete, vertebral stripe. This species is found in Burundi, Democratic Republic of the Congo, Ethiopia, Kenya, Mozambique, Rwanda, South Africa, Swaziland, Tanzania, Uganda, and Zimbabwe. Six subspecies are recognized, including the nominotypical subspecies. As the name implies, the common slug eater is a specialised predator and feeds on snails and slugs, mostly finding its prey through chemoreception, using its tongue. It swallows its prey quickly before too much defensive mucus is produced, extracting snails from their shells through the shell opening, or by smashing the shell against a rock while grasping the soft body in its jaws. The common slug eater usually gives birth to litters of three to twelve young. However, broods from large females may consist of as many as 22 newborns, each measuring eight to eleven cm (3⅛-4¼ inches). The total combined weight of the young may exceed the weight of the female after giving birth. Birthing season is January and February (late summer in southern Africa). 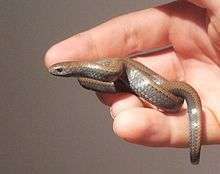 The snake is a popular pet, which feeds and breeds readily, and because of the nature of its prey item, it is easy to keep. When alarmed, the snake secretes a noxious substance from glands near the base of the tail and rolls up into a defensive spiral with the head in the middle, leading to the Afrikaans common name tabakrolletjie ("tobacco roll"). Wikimedia Commons has media related to Duberria lutrix. 1 2 The Reptile Database. www.reptile-database.org. ↑ Pyron, R.A.; Burbrink, F.T. ; Wiens, J.J. (2013). "A phylogeny and revised classification of Squamata, including 4161 species of lizards and snakes". BMC Evolutionary Biology. 13 (1): 1–53. doi:10.1186/1471-2148-13-93. PMC 3682911 . PMID 23627680. ↑ Roland Bauchot (Ed.) (2006). Snakes: A Natural History. Sterling. ISBN 978-1-4027-3181-5. ↑ Carruthers, Vincent (2005). The Wildlife of Southern Africa: A Field Guide to the Animal and Plants of the Region. Cape Town: Struik Publishers. p. 92. ISBN 1-86872-451-4. ↑ edited by G. M. Barker. (2004). Natural enemies of terrestrial molluscs. Wallingford, Oxon, UK: CABI Pub. ISBN 0-85199-319-2. ↑ Walter Rose (1950). The Reptiles and Amphibians of Southern Africa. Cape Town: Maskew Miller. ↑ Branch, Bill (1988). Bill Branch's field guide to the snakes and other reptiles of southern Africa. Cape Town: Struik. ISBN 0-86977-641-X. ↑ "SA Reptiles (forum)". 2008. ↑ "Slug Eater - Duberria lutrix". The ultimate field guide. 2008.